A few years back, one night during the week of ComicCon in San Diego, many of us had gathered in the old meeting spot of the lobby of the Westin hotel. There was quite a large crowd of people, and it was a mixed group of friends, acquaintances and friends of friends or strangers that were soon-to-be-friends. Many of us carry around a sketch book to draw in while hanging out, and I happened to have a new one that had not been drawn in yet. 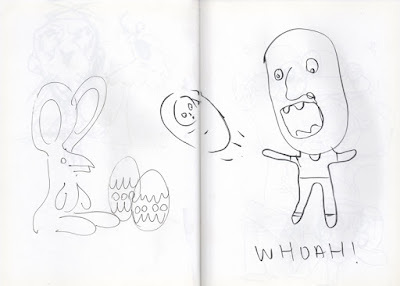 I can't remember how it all started, but I suddenly found myself being challenged by Rick Berry to a “who can draw stupider” battle. He actually sounded off with a very loud whistle which silenced the entire lobby full of people, and he announced that we were going to start the battle for anyone who'd like to watch. It started off as a one-on-one battle. 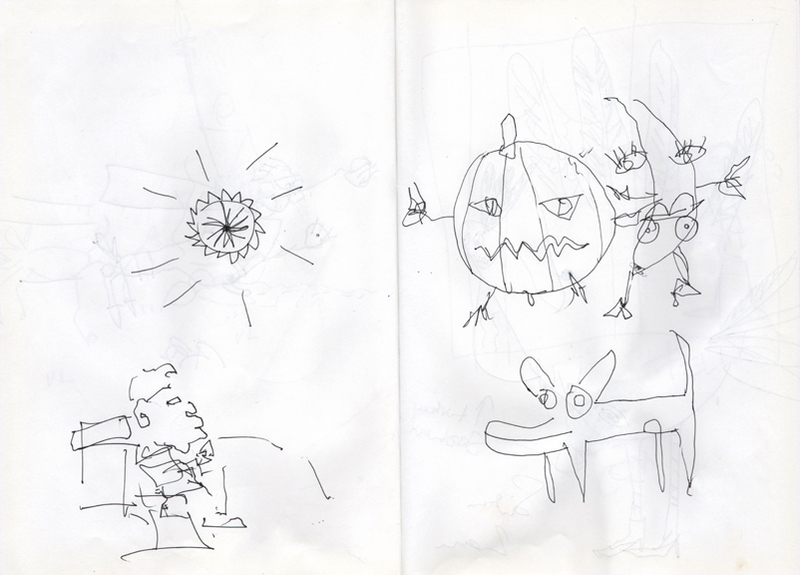 First, Rick drew something to which I argued “That's not stupid enough!”, and then I'd draw my attempt. (Apparently, I was really competitive, and thought for sure I had this one in the bag). 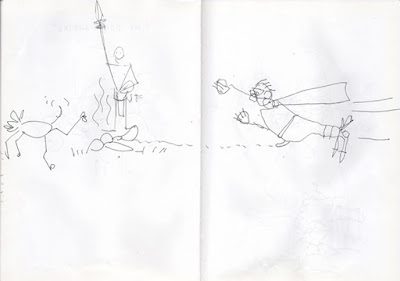 After a couple of those, we ended up even doing some collaborative 'stupid drawings', until many people began to gather around to witness this battle of 'bad' drawing. Much to our delight, the battle grew to any and all who challenged us.. or anyone who just wanted to try their hand at 'stupid drawing'. It made for a really entertaining night! 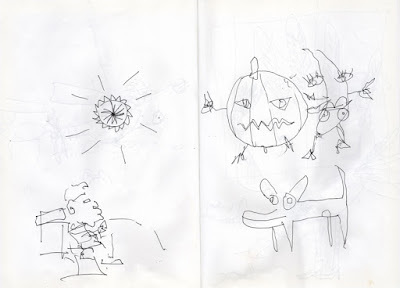 What happened was pretty interesting, and aside from accumulating quite a great group of quick drawings that each of us thought would surely be the Winner of Stupid, we all realized that drawing a 'stupid drawing' really wasn't as easy as it might've seemed. What it came down to was always the question “what is stupid?” Though many drawings might've been silly, perhaps a little less tasteful (some might say), or an attempt at 'bad' (as in not as good as one might usually draw), none could really be deemed 'stupid'. Some tried scrawling more crude drawings or sketches that seemed more childlike, but these also didn't really equate to stupid. It ended up really getting us all to think, and had some of us realizing that to not think while drawing isn't necessarily the equivalent of stupid either. 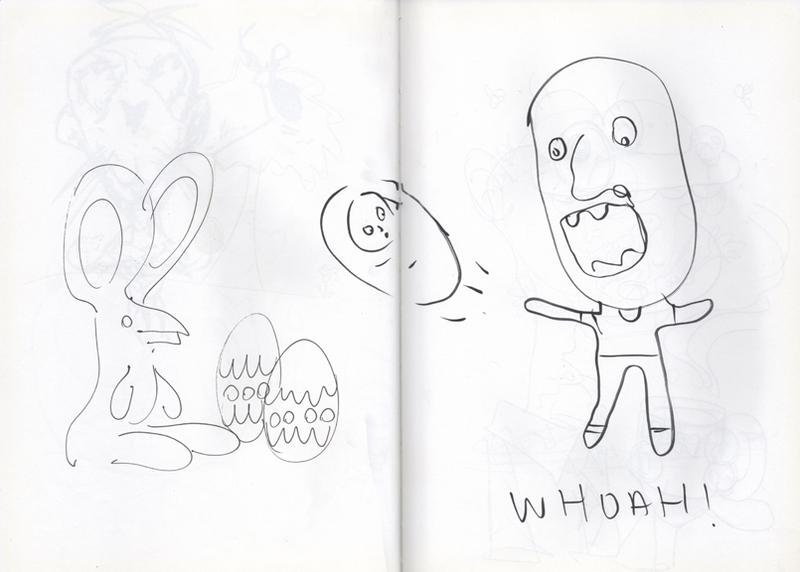 I've since occasionally taken this sketch book to other get-togethers and asked people to draw in it – only 'stupid drawings' are allowed in this particular sketch book. It's yet to have been graced with a drawing that might fit the criteria, and it's pretty apparent that it really may never happen. 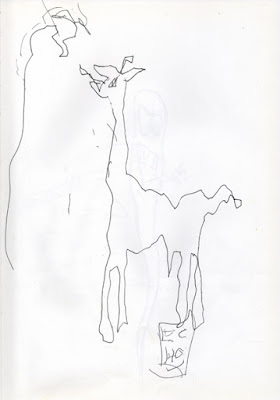 I'm sharing just a few of the drawings here. This book now has about 50 pages filled front and back, and really is a hoot to flip through. The first drawing of the challenge. 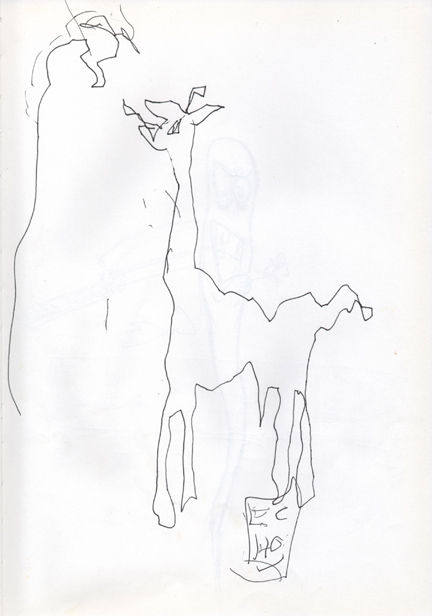 This artist actually drew this giraffe with no hands, but by holding the pen between her breasts. A new spin on the ol' hand-traced turkey. Throwing swaddled babies is definitely stupid, yes, but the drawing itself is pretty funny/clever. A collection on facing pages by several different artists. 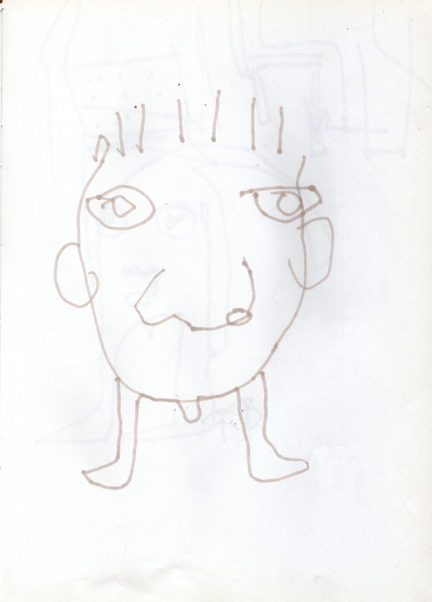 If anyone feels so inclined to try their hand at drawing a 'stupid drawing', please share it! I'm sure everyone would love to see it! And it would be great to hear your thoughts about the experience and/or outcome too!